The focus of this course is on the design of interactive computational media that enhance and support the cognitive, communication, and creative processes of their users, and on user interface design for computational media. Throughout the course, students will work in groups of three-four on a project to apply user centered, iterative design of prototypes of computational tools appropriate to the needs of a specified user group. Students will learn about users & conceive, design, prototype, and evaluate a design. Since this course is not a programming course, there aren’t any programming tools used. This course focuses on the concept of design and prototyping, in which case tools such as Adobe Photoshop, and simple pencil & paper are used to sketch out the UI and other parts of the prototype. For presentations, Microsoft Word and Microsoft Powerpoint are used. 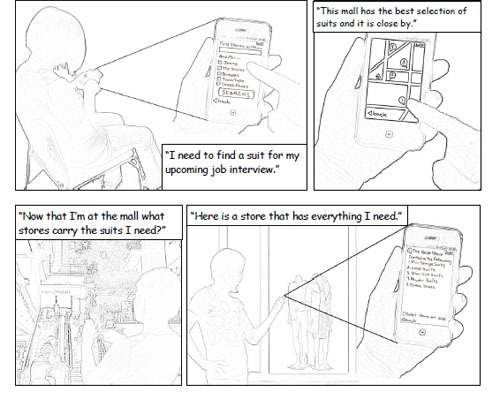 Our goal is to design an efficient, time saving device/software for people to shop for clothes. This was a sub-problem of the main problem presented in this course, which was to help people better manage their clothing. Clothes are an everyday part of people’s lives and we want to minimize the time and effort required to choose and decide what to buy and wear. Our primary stakeholder group are people aged 18-29. Since most of our studies and research were conducted on people our age, it makes sense for our design to appeal to this target audience. While the application will learn user preferences from user’s interaction with the application and information provided by the stores where the user shops, it provides functionality for the user to review and adjust any preferences. Additionally, before the user starts using the application for the first time the application will ask her to answer a few questions so that it can provide relevant information about clothing stores that cater to the user. When a user wants to go shopping for clothes she can search for a particular store, item, or brand using the search feature. The feature will perform a keyword-based search and will return the results in form of shopping center locations together with details about the shopping centers and why they were chosen. Additionally, the user can check frequently searched keywords to be included in the search. information pertaining to a store when a bubble is clicked. 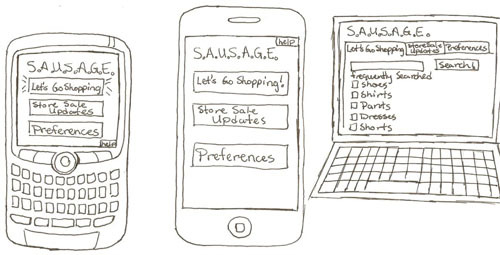 The sketch shown above was made to show how our application would look like on different devices. 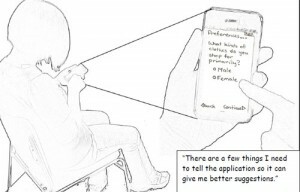 In this case, the sketch shows the application on a Blackberry, an iPhone, and a laptop. 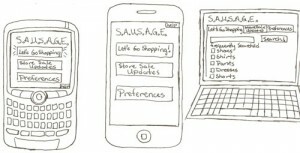 The purpose of this sketch was to show to variation in size of the interface on different devices. 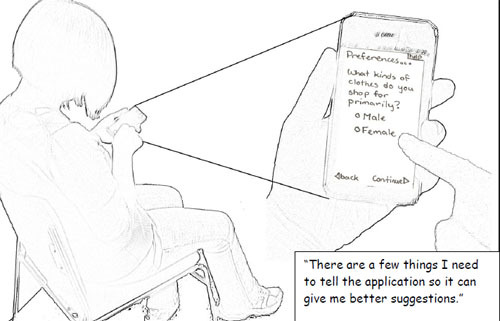 This sketch shows that the application can be supported on different platforms but does not compromise in terms of how much a user can see. We decided on three evaluation plans: Think aloud (which allows users to give feedback), Cognitive walk through (which allows peers to give feedback) and heuristic evaluation (which allows for in-depth evaluation of all criteria). -The task of setting up user preferences and searching for a particular item in the area. 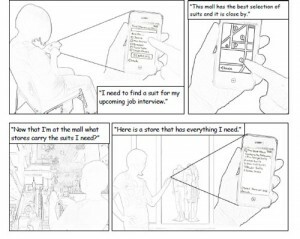 -The task of locating a store after inputting their location. The Preferences section of the application will be redesigned so that there is no need for the user to configure any preferences the first time she uses the application. Additionally there will be no need for the user to enter information about gender, age, sizes, or preferred stores. The application will infer this information from user’s shopping habits. The improved design will only allow users to review and possibly delete preferences that application collects from user’s shopping habits. The information stored in the preferences will include: shopping frequency and information about different garments purchased at those stores This information will be used by the application to make smart suggestions and better prioritize search results for the user. The store locator feature will be improved by making changes to the way user interacts with the search results. Namely, once user enters keywords into the search field and clicks on the “Search” button the application will still display a map centered at user’s current location and mark different shopping centers located in the vicinity. Shopping center/store markers will now have names listed alongside search priority number to make it easier for the user to understand the meaning of the markers. Additionally the names will be underlined to afford clicking on them. Do not count the days; make the days count.